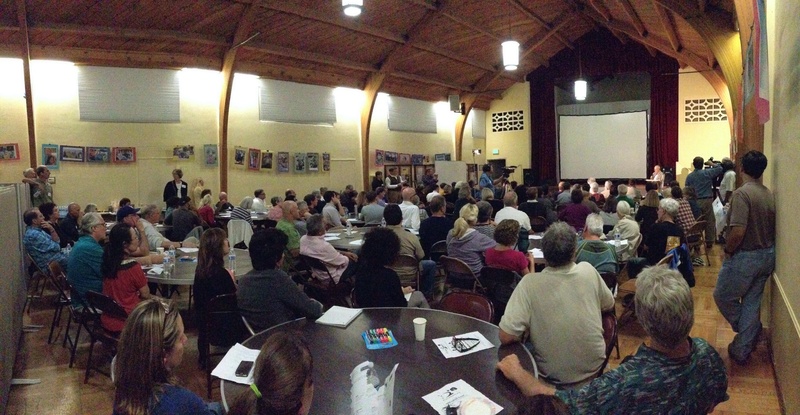 If you weren’t among the 150 or so who attended Airport2Park.org’s workshop Thursday evening about turning Santa Monica Airport into a great park, you missed an inspiring event. What was so exciting was how optimistic the gathering was. So much of local politics — I suppose all politics these days — is about fear of the future. This event was all about how good the future could be. Rios’ presentation ignited the imaginations of the public, who then went to work in ten small groups and came up with ideas that showed the power and logic of collective action. I’m going to make a few remarks to put what we are doing tonight in historical context, because we are at an historical moment. We at Airport2Park have called this a once-in-a-generation opportunity, but it’s really more like a once-in-a-century opportunity, because it was nearly a century ago that the City of Santa Monica began acquiring the land at the airport with money raised with a parks bond. At that time, an airport — basically a dirt strip then — was considered park-like, but that hasn’t been the case for a long time. Donald Douglas may well have been the most important person in the history of Santa Monica, but if so, he became that by turning the airport into one of the world’s biggest industrial plants, part of the arsenal of democracy that won World War II. By the ’60s, however, when the City denied Douglas’ request to condemn residences to expand the runway so that he could build jets there, the residents of Santa Monica and city officials had recognized that the airport was no longer a good fit. Things got worse when the FAA required the airport to serve jets. In response to that, in 1981 the City Council voted to close the airport. The FAA fought back in court, and the City, the FAA, and the pilots entered into the famous, or infamous, 1984 Settlement Agreement. The 1984 agreement is clear: the City covenanted not to close the airport prior to July 1, 2015. Given this provision, it’s plain that all parties to the agreement believed at the time that the City had the right to close the airport. Speaking for myself, I got involved in local politics about 20 years ago, and all I can say is that everyone I met said that the airport was going to close in 2015. It was also during this time that organizations like Concerned Residents Against Airport Pollution got started – they brought to everyone’s attention the negative impacts of the airport. The 1984 Agreement gave all aviation users 30 years to earn back a return on their investments and make arrangements to leave the airport. The aviation users often defend the airport by saying that nearby residents knowingly bought homes near an airport, but it’s they who have been on notice, for more than 30 years, that the airport would close. Notwithstanding the clear language of the 1984 Agreement, a few years ago the FAA began claiming that under a provision of a 1948 agreement, the “Instrument of Transfer,” under which the federal government returned the airport to the City after leasing it from the City during the War, the City was obligated to operate the airport in perpetuity. I want to be clear that we at Airport2Park – and also the folks in City Hall – don’t accept the enforceability of this clause, and we don’t believe that anyone in 1984 believed that the clause was enforceable. But I won’t go into that legal analysis now; it would take a long time and we have work to do. But it is important to note that based on research and documents uncovered by the groups working to close the airport, it is apparent that even assuming that the Instrument of Transfer is enforceable, it would not apply to that part of the airport, called the “Quitclaim Parcel,” that includes the westernmost two thousand feet of the five thousand feet of the current runway. Meaning that this part of the runway could be closed, but a functioning smaller runway would be left to satisfy the Instrument of Transfer if it is enforceable. Last April Marsha Moutrie, the Santa Monica City Attorney, told the City Council that she thought this approach – using the Quitclaim Parcel – to sidestep any FAA claims based on the Instrument of Transfer was promising, and the council directed her to investigate further and report back in March 2014. At the same meeting, the council members expressed views in favor of converting this city-owned asset into a park if all or part of the airport can be closed. We are now presented with exciting opportunities, but they may run in stages. The first stage is that the City can reclaim the Quitclaim Parcel July 1, 2015, the same date that all the leases for aviation uses at the airport expire and can be terminated. Without challenging the FAA on the Instrument of Transfer, the Quitclaim Parcel could then be turned into a park, and the runway could be reduced to less than three thousand feet. We believe that ultimately, with a less than 3000-foot runway, which could not service jets, and without aviation services, the airport would have to close, and the whole of the runway and adjacent areas could be turned into a mile-long park. 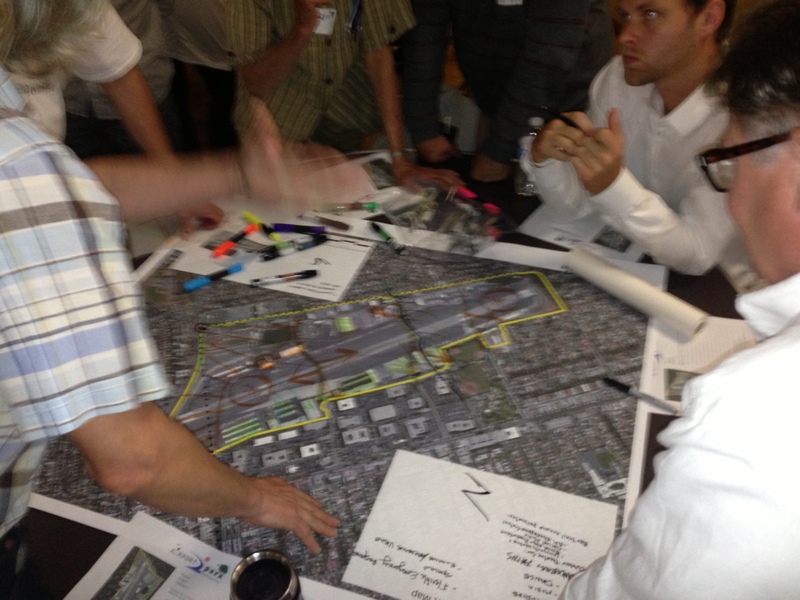 After the City Council’s meeting in April, we formed Airport2Park.org to gather support for building a great park at the airport site, and we started planning this workshop over the summer. 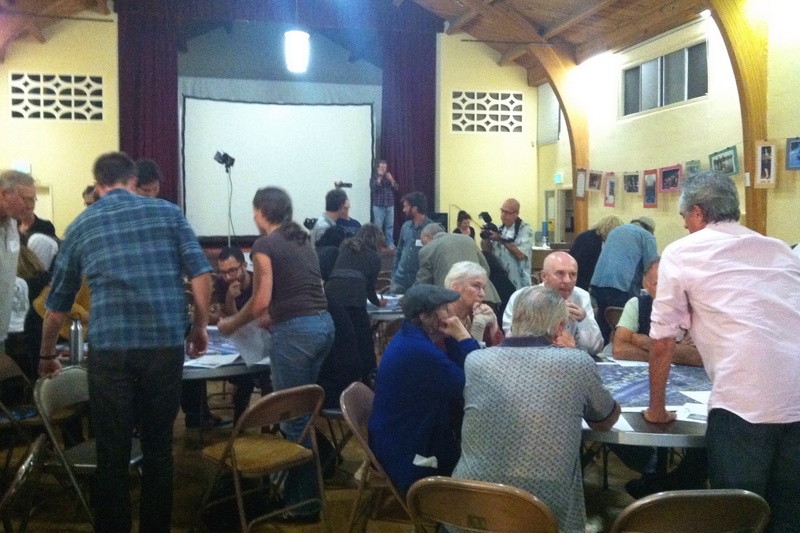 Surveys by Community Against Santa Monica Airport Traffic have already shown overwhelming local support for a park, but we need to create a movement to make this happen. We’re gratified by the support we’ve already received from the Sierra Club and the Friends of Sunset Park neighborhood group, and we expect more endorsements to follow. The interests behind the airport, including the aviation industry and the FAA, a captive agency if there ever was one, will fight closure of the airport with every tool they have. But keep in mind — the FAA always says that it will not allow airports to close, but hundreds have closed in past decades. Unfortunately, we know that the supporters of the airport will use fear as a fundamental tactic. What is scarier than anything else? . . . Well, it’s always the unknown. What the airport supporters say is, “don’t close the airport, because you don’t know what will take its place.” The politicians, they say, will allow big developments there that will be worse than the airport. Our movement to build a park at the airport is designed to present a credible and a beautiful alternative to the airport, a positive message that everyone can support whether they live under the flight path or simply want a park to hike or cycle in, or one where they and their kids can play sports, or one where nature can be restored. A park would be a healthful, sustainable, environmentally safe and economically sound investment in Santa Monica’s future. Tonight we’re taking a major step in that direction. Later on this evening we’re going to ask you to brainstorm about what a park could be, what it could mean. After that, we’re going to ask you to create a movement – at the city level, the county level, the state level, and yes, the federal level – to make this happen. Tonight, let’s inspire ourselves, and hopefully others, as to what we can build for generations – for centuries – to come. And let’s have fun doing it.